There are five species of Strelitzia, all from the Eastern Cape and Natal provinces of South Africa. 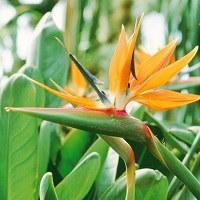 The most famous of the five is Strelitzia reginae, commonly known as the Bird of Paradise flower or the Crane Flower. It has huge flowers that look like the head of a crane, mostly orange in colour, with some forms in yellow. These plants grow in a mild climate with rain most of the year, and are generally not tolerant of frost. The original species of Strelitzia reginae is evergreen, forming an underground rhizome. It grows to about 1.5m in height and produces flowers in winter and spring in the UK. There are two yellow formed varieties of Strelitzia reginae, called Kirstenbosch Gold and Mandela’s Gold, both quite pricey to buy. Strelitzia juncea is also highly sought after, with a similar flower to S. reginae, and spiky leaves. A white species Streltzia alba is sometimes grown in the UK. The remaining two species of S. nicolai and S. caudata are tall trees, with banana-like leaves. They are not frost tolerant and need at least 12m of glasshouse height, so are not commonly grown in the UK. There are some good specimens in the Mediterranean Biome of the Eden Project in Cornwall. By division: Mature plants form rhizomes which can be divided in the spring after flowering. The plants may not flower for a couple of years after dividing. By seed: Plants are commonly grown from seed. 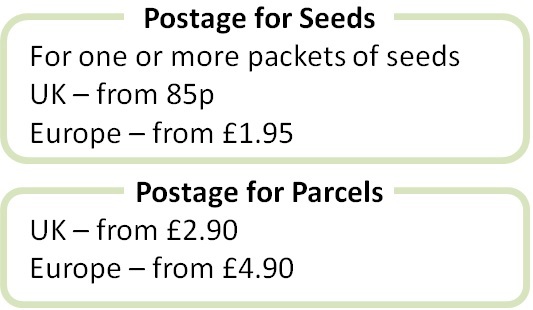 The seeds are best sown fresh, but can be stored in a fridge in a sealed container. The orange tufts are removed and the seeds soaked in warm water for 24 hours before sowing x 1.5 the depth of the seed in well drained seed compost. Seeds take 4-8 weeks to germinate, some longer. They germinate best with a constant 25°C bottom heat. Young plants should be grown on in the shade. Flowering takes about 3 years in ideal conditions, sometimes 5 years or longer. Strelitzia reginae prefers frost free conditions in sun or light shade and rich soil. Some say these plants are hardier than expected and could potentially survive outside in warmer UK gardens with protection. S. juncea can tolerate light frost. The plants like regular feeding when growing and flowering. Strelitzia can be susceptible to red spider mite, particularly in greenhouses. The biological control Phytoseiulus persimilis can help in the summer months and sprays containing bifenthrin, thiamethoxam and abamectin are also effective.